It is interesting to note exactly how early cities develop their character. The lyrics of this song describe someone sightseeing in London with some friends. They visit Leicester Square and many other places of interest. 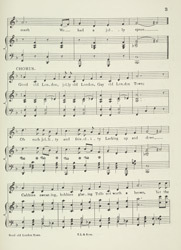 Lyrics such as '...cabbies swearing, bobbies glaring...' give an insight into life in 19th Century London and we can vividly imagine Hansom cabs making their way through the noisy streets. In 1877 there were over 4000 Hansom and four wheel cabs, managed by over 10,000 drivers, as well as pedestrians travelling across London to work and tourists visiting the capital city. The streets of London would have been very busy.